The 35th Infantry Regiment Association salutes our fallen brother, SP4 Thomas Vincent Pakula, who died in the service of his country on December 27th, 1969 in Darlac Province, Vietnam. The cause of death was listed as Small Arms/AW. At the time of his death Thomas was 23 years of age. He was from Stambaugh, Michigan. Thomas is honored on the Vietnam Veterans Memorial at Panel 15W, Line 99. The decorations earned by SP4 Thomas Vincent Pakula include: the Combat Infantryman Badge, the Bronze Star with V, the Purple Heart, the National Defense Service Medal, the Vietnam Service Medal, the Vietnam Campaign Medal and the Vietnam Cross of Gallantry with Palm Unit Citation. 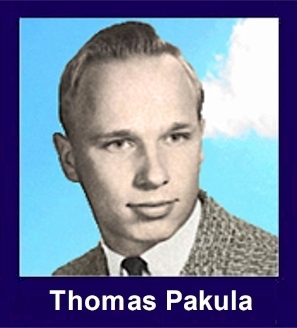 OBITUARY Iron River Reporter January 14 1970 "Obituaries: Pakula"
Services were held at the LaFave-Brooks Funeral Home on January 8 at 9:30 a.m. for Sp/4 Thomas V. Pakula, of Stambaugh, who was killed in action in Vietnam on December 27. He was in Vietnam for seven months and was fatally wounded on a combat mission. At 10 a.m. Rev. Fr. Casimir Adasiewicz intoned the Requiem Mass at the Assumption Church of Iron River. The Rosary had been recited at the funeral home on Wednesday [Jan 7] evening, and the family requested that flowers be omitted. Burial was in Stambaugh Cemetery with full military honors conducted from Fort Benjamin Harrison. STAMBAUGH-The parents of a Stambaugh soldier killed in action in South Vietnam last December 27 were presented last week with a series of awards and medals by Major Henry Greenwood, Ishpeming, in a ceremony at the family's home. Mr. and Mrs. Leo S. Pakula, 302 Washington Ave., received the medals awarded posthumously to their son, SP-4 Thomas Vincent Pakula. SP-4 Pakula died while serving as point man with a patrol going out to set up a night ambush position. Pakula spotted the enemy and engaged them with his rifle. During the engagement he was killed by a sniper's bullet. Pakula's action, the Army said, saved the lives of several members of his squad. Awards presented to Pakula's parents on his behalf included two awards of the Bronze Star Medal for meritorious achievement and heroism, the Purple Heart, National Defense Service Medal, Vietnam Service Medal, Vietnam Campaign Medal, Combat Infantryman's Badge, and Sharpshooter and Marksman Badges. Pakula had served in Vietnam from July to December. Prior to entering the service he had been a student at Michigan Technological University, Houghton, where he received a degree in forestry. In addition to his father and mother he is survived by three brothers and sisters. Tom was a classmate in Stambaugh, MI. He was a terrific person, a wonderful friend and courageous football player. Vietnam took wonderful people, during and after the war, but none better than Tom. Tom, it has been forty years since we shared that stage at Dee, and received our diplomas. Those four years were filled with long hours of study, but we also shared a lot of laughs. Gene, Vern, Hammer, Norm, and all of the other professors gave us the knowledge we needed to be successful at Tech and beyond. John, Mike, Ed, Larry, Tom, Dennis, Robert, and other classmates shared our stories, laughs, and lives during those four years. We were both called to serve our country and found ourselves in Viet Nam, the Republic of. Young soldiers, so far from Michigan Tech. Why some came home in a casket, and others didn't, I will never understand. Never. When I touched your name inscribed on that black stone in Washington, D.C., tears filled my eyes. There must be a place in God's heaven where young soldiers and old veterans can go, and share laughs again. A place where the smells, the noise, the chaos, the horrors of the battlefield are forgotten. When I meet you there, Tom, I will salute you, and smile a THANK YOU, you served well. Tom, you accomplished so much in your short life. Your family, your friends, and your country are better because of you. You gave all and left a lot. I am proud to have known you, my friend, my brother. For heroism in connection with military operations in the Republic of Vietnam. Specialist Four Pakula distinguished himself while serving as a Rifleman with Company B, 2/35th Infantry. On 27 December 1969, Company B was moving through a suspected hostile area when Specialist Pakula, the pointman, spotted an enemy ambush. With complete disregard for his personal safety, Specialist Pakula remained in his forward position and immediately engaged the enemy. This daring action alerted the rest of the company and prevented them from entering the ambush. While placing suppressive fire on enemy positions, Specialist Pakula was killed by an enemy sniper. Specialist Four Pakula's courageous actions, self-sacrifice, and exemplary devotion to duty are in keeping with the highest traditions of the military service and reflect great credit upon himself, his unit, and the United States Army.